You can pick up a kettlebell (excuse the pun!) for relatively little cost. In terms of benefiting your workout they are worth a lot, as they give a whole body workout. If you know the moves, you’ll see some gains as you get used to regularly using the kettlebell. Hold the kettlebell the right way up, but at the top by its “horns” and push your shoulders back so your shoulder blades are together. With your feet just further than hip-width apart, turn your feet out slightly and squat down – as if you are trying to sit back – go as low as you can before returning to a standing position. 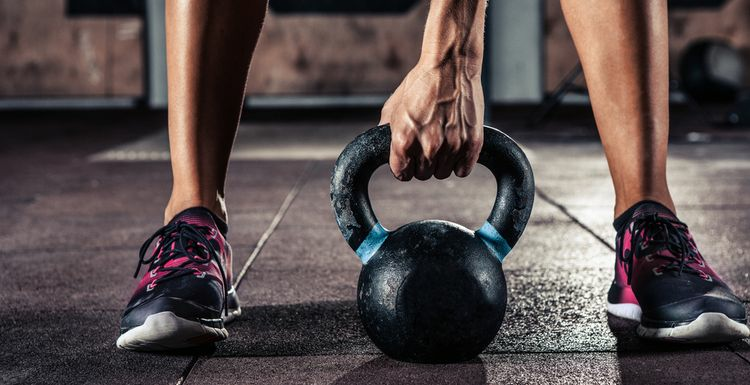 With a straight back and bent knees, around shoulder width apart, hold the kettlebell by the horns so it hangs down, just about level of your knees. From your hips, swing the kettlebell forward until its directly in front of your torso, before swinging it back to the starting position. Keep your eyes focused forwards. Make sure you have a weight of kettlebell that you are comfortable with. Holding it with one hand at your shoulder, tuck your elbow in and perform a squat. As you stand up from the squat, press the kettlebell overhead. Ensure you swap arms after you start to lose form. Place the kettlebell on the floor and take a staggered stance with your right foot in front. Your foot should be planted just outside the weight. Dig the ball of your left foot into the floor behind you and bend your hips so your torso is angled about 45 degrees to the floor. Rest your right elbow on your right thigh for support and reach for the kettlebell with your left hand. Keeping your shoulders square, complete all your reps on one side and then repeat on the other side. You’ll need two kettlebells for this exercise. Starting in a push up position, hold a kettlebell in each hand, and alternating your arms, bring each kettlebell up towards your shoulder. Repeat each side ten times. I borrow my partners kettlebells and do some moves first thing in the morning to wake me up. Along with a dog walk, it's keeping me active on my non-gym days. I am getting kettlebells for Christmas. Can't wait! I will definitely be using these exercises.